Good defense is a key part of every winning game plan. One of the challenges all coaches face is how to evaluate individual defensemen as these players do not light up the scoreboard. 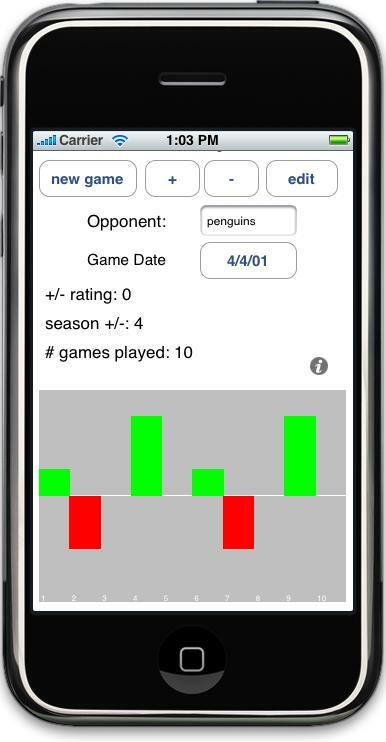 This program makes it easy to capture Plus Minus stats, player by player, game by game across an entire season. Plus/minus is mainly used to measure defenders and forwards who play a defensive role since offensive forwards are better measured by scoring statistics such as goals and assists. It is directly affected by team performance, thus accurate comparisons can only be made by taking into consideration the defensive performances of the team as a whole; for example, a player who is +15 on a powerful offensive team is considered by hockey statisticians to have done worse defensively than one who is +10 on a poor defensive team. I play on several different hockey teams and take this app with me to every game. I leave it on the bench. Between shifts I use it to track my personal Plus Minus. In the past I tried to keep track of this in my head; however I would be too exhausted at the end of the game to remember. Writing it down did not help. I kept loosing the paper. With paper, I had to do a lot of work to get the big picture. It's amazing the insite I have gained using this program. I played a game where my team lost 6 to 1,yet I was +1 for the game. I have been able to identify teams that I am personally strong or weak against, and have started to analysis how I need to change my game to counter these foes.